Emperor Taizu (born Zhao Kuangyin, Wade-Giles: Chao K’uang-yin; March 21, 927 C.E. – November 14, 976) was the founder of the Song Dynasty of China, reigning from 960 C.E. to 976 C.E. The Song dynasty lasted until 1279. He reunified China after following a period of political instability and fragmentation. He strengthened the central administration and weakened the power of local warlords. He encouraged free discussion and thought and promoted science, the arts and literature. He reformed the civil service, restoring its original merit-based entry that had been compromised by appointments on the basis of birth. Although he seized power through the military, he introduced reforms that made it much more difficult for this process to be repeated. During the Song dynasty, Confucianism tended to attract state sponsorship and there was a decline of support for Buddhism, which was regarded as foreign. On the other hand, the concept of the universal man also developed during the Song period. His family was of fairly modest origins and cannot be traced back with certainty further than the late Tang Dynasty. His ancestor Zhao Ting (828-874 C.E.) was an official who served in Zhuozhou, in Hebei, near where the family lived. His second son Zhao Ting (851-928) and his son Zhao Jing (872-933) also served as local officials in Hebei. Zhao Jing's son Zhao Hongyin (899-956) decided against a civil career and became a military officer instead. Zhao Kuangyin had little interest in a classical education and also joined the military eventually rising to be the commander of the Palace Army. It was this post that enabled him to rise to power. The last competent Second Zhou Emperor, Shizong (reigned 954-960) died leaving an infant boy on the throne. 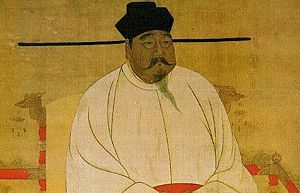 Zhao Kuangyin, as the commander of the Emperor's guard, allegedly reluctantly and only at the urging of his soldiers, took power in a coup d'etat. In 960 C.E., Zhao reunited China after years of fragmentation and rebellion after the fall of the Tang dynasty in 907 C.E. and established the Song dynasty. He was remembered for, but not limited to, his reform of the examination system whereby entry to the bureaucracy favored individuals who demonstrated academic ability rather than by birth. Zhao also created political institutions that allowed a great deal of freedom of discussion and thought, which facilitated the growth of scientific advance, economic reforms as well as achievements in arts and literature. He is perhaps best known for weakening the military and so preventing anyone else rising to power as he did. Zhao reigned for 16 years and died in 976 at the age of 49. His younger brother unexpectedly succeeded him, even though he had four living sons. In the traditional historical accounts his mother, the Dowager Empress Du, warned him that just as he rose to power because if Zhou Shizong left an infant on the throne, someone else might usurp power if he did not name an adult as his heir. His brother ruled as Song Taizong (976-997 C.E.). In China's folk memory, Song is said to have murdered his brother and invented his mother's advice as justification. Zhao’s temple name means "Grand Forefather." Zhao's reforms were comprehensive and far-reaching. His aim was to return both military and civil authority to the imperial center. He created a paid, professional army of elite soldiers, which diminished dependence on soldiers provided by local commanders or on conscripts. Zhao transferred generals and senior officers to new postings on a regular basis; thus, they could not form too close a bond with their troops and contemplate seizing power. By recruiting and training landless peasants for his professional army, he earned their loyalty and minimized the possibility of a popular revolt of the poor. Instead of military commanders serving as regional officials where they could build up a support-base and possibly rival the center, he appointed civil officials who were also regularly transferred. The whole centralized administration established by Zhao Kuangyin has been described as “a kind of radiation spider web, with every aspect of government concentrating in the imperial court.” The whole system was designed so that no single individual could accumulate too much power. At the very top, below the emperor, the power grand councilor (zaixiang) was weakened by restricting his role to civil matters and by requiring that he share his responsibilities with a vice grand councilor (canzhi zhengshi). Military affairs were controlled by a newly created bureau and other important functions were distributed among three departments of state, namely financial, the census bureau, tax bureau, and the salt and iron monopoly bureau. Certain titles were bestowed on individuals, but real responsibilities for actually carrying out the tasks were devolved to temporary officials—rather like having a named minister of state while the career civil servant does the work. The minister would, in reality, carry out a different function. The disadvantage to this system was its cost; it may have consumed funds that should have been used in defense of the empire, which was under threat from the Northern Han. Inside the state, the autocratic government of Song theoretically made it impossible for generals to challenge the power of the emperor. Thus, the Song state was a highly civil-led governmental system. Equally, the Song emperors refused to spend too much power in war campaigns against the northern intruders. It was obviously more advantageous to pacify the nomads in the north with tributary presents instead of fighting against them. Internal and external peace with a prosperous economy was more worth even in the eyes of Song period philosophers who renewed Confucian thought. On the other hand, Zhao chose to pay the Han tribute instead of fighting them. It appears that, once emperor, Zhao Kuangyin valued internal and external peace more than war making. He started the renewal of Confucian thought that became a main characteristic of the Song dynasty. He also promoted trade, helping to establish a new merchant class, which in turn created closer links between the coastal areas and the interior. What is sometimes called the “Chinese industrial revolution” dates from his reign—production of iron ore increased dramatically during Zhao’s rule. Literacy also increased due to innovations in printing technology. Renewed interest in philosophy resulted in the development of the concept of the “universal man.” Like the “Renaissance man” of later European thought, the universal man, or person, was a rounded personality who combined the qualities of scholar, poet, painter, and statesman who could paint, write calligraphy, and craft hard-glazed porcelain. The term “the Song Renaissance” is sometimes used to describe the period inaugurated by Zhao. Driven by the ideal of cultural refinement, the Song dynasty was an era during which art, literature and science flourished. Alongside the Han Dynasty (206 B.C.E. - 220 C.E.) and the Tang Dynasty (618 – 906 C.E.) work in jade and fine-arts was greatly valued and developed. Under the dynasty established by the first Song emperor, China enjoyed a period of economic growth accompanied also by great artistic and intellectual achievement. Thus, this period is has been compared with referred the “Renaissance” that spread through Europe. ↑ Theobald, Ulrich. 2000. Chinese History – Song Dynasty event history. Retrieved March 20, 2007. ↑ Beck, Sanderson. 2004-2005. Ethics of China 7 B.C.E. to 1279 by Sanderson Beck. Retrieved March 20, 2007. History of "Zhao Kuangyin (Emperor Taizu of China)"